The Marblehead lighthouse is an iron skeleton structure at the entrance of Marblehead Harbor, in Massachusetts. This lighthouse was built in 1895 to replace the original structure built in 1838, and stands 105 feet tall. An interesting story about this lighthouse has to do with a very industrious lightkeeper. 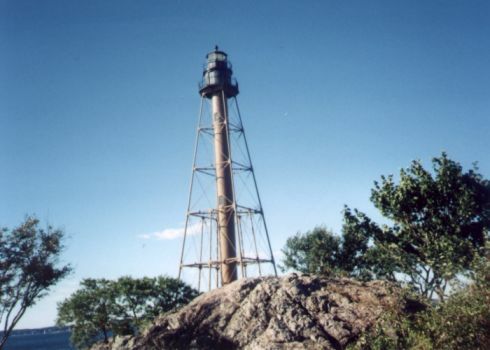 Sometime in the late 1930s a powerful hurricane came through that area and the light at Marblehead was extinguished. The desperate lightkeeper drove his car to the lighthouse and used the battery of the car to keep the light going the remainder of the night. The drive out to the lighthouse will take you through Marblehead and by some of the most beautiful homes that I have ever seen. The area around the light is now a park maintained by the city, and a small patch still remains in possession of the Coast Guard.